and reading for an hour or more. and i am absolutely in love with this little french-themed cafe. and their interior is airy and homey at the same time. I'm a pushover for chocolate croissants. I don't drink coffee often, but when it's cold (like today), the combination of coffee and chocolate sounds perfect! this place looks so cozy! i'm not a huge coffee fan, but i love croissants and hot cider. and it's just so cute in there! What a cute place! I'm always on the lookout for little cafes and coffee shops for reading and idling away the afternoon. coffee + magazines + croissants = little piece of heaven! oh my gosh that is the cutest place ever!!! wow, this cafe is so cute. i think even starbucks will forgive you for buying your coffee from here occassionally! What a lovely cafe! So quaint and cozy. I'm sure you enjoyed that yummy croissant! That place looks so perfect! I could for sure spend an afternoon there, pretending I was in Paris! neato...we should go there sometime! the food looks delicious. i love independent coffee shops! i wish we had one as charming as this near us! This place looks lovely! Gotta love the coffee!!! I love Starbucks but I also love an cozy, independent coffee shop ! Are the owners French ? The cafe looks charming!!!! I love french things!!! The croissant looks yummy hope your having a fine holiday! yumm i havent had a chocolate croissant in forever!!! I think I died and went to heaven. 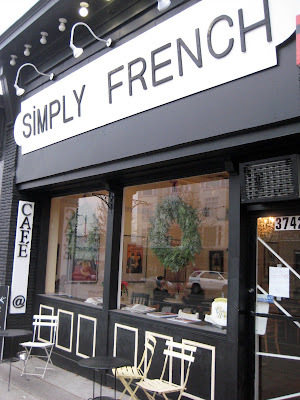 A cafe that has a french theme?! This is so adorable. Where is this?? I need to see this, and perhaps make a road trip out of it if it's far away. it's in vancouver, it's just lovely! I suppose this is not anywhere near me?? Can you send me a cup of coffee in the mail from this shop, please? Oh, don't forget the chocolate-filled croissant!! !